Bambi: This Is What We Do! We received a call from John DiLeonardo, an NGAP adopter, who had adopted Bambi from us approximately 10 years ago and wanted to return her to us at the age of 12 years 4 months old (born July of 1998). He arranged to bring her in one Thursday and, of course, I wanted to make sure I was there when she arrived so I could check her overall condition. After over 20 years of adopting greyhounds and seeing some of them returned, I could most certainly categorize Bambi as 'pathetic'. 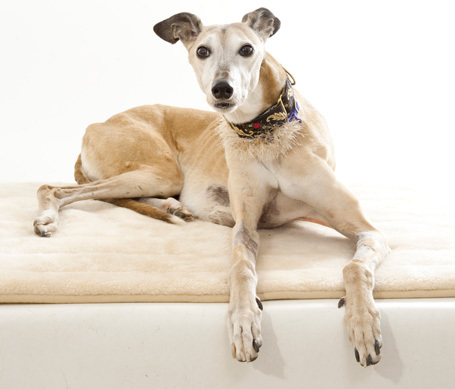 Bambi stood in front of me on the day she was returned, on a bed we had placed down for her, all bones, with a drain protruding from a wound in her chest. The wound was dripping and within a few minutes there was a puddle of blood underneath her. She had significant swelling in one leg and her teeth were atrocious. The owner stated that he was returning her because she was hurting herself while he and his wife were away at work, but he was very vague regarding the circumstances. She had been to VSEC in Langhorne a few days prior to her arrival at NGAP and received surgical repair to a long, but not deep, wound that extended several inches along her chest bone. The owner went on to tell us that Bambi was not eating. VSEC had weighed her in at only 44 lbs., although when she was adopted from us, she weighed 57 lbs. John left us a check for $50.00 to put towards her care, that he later stopped payment on. We immediately offered Bambi some Hill's A/D, which is the food of last resort. It is a prescription diet food and has the consistency of pudding. I first force fed her some of it, but then found that she would eat it on her own. We also put her on IV fluids as soon as John left. We laid her down in the senior room and covered her with a blanket. In a short while, I received a call from one of our technicians that she though Bambi was dying. Her temperature had dropped, and her gums were pale. We covered her with warm towels and a heating pad and were able to stabilize her. No, Bambi was not ready to die just yet, but she was not able to do much of anything else, either. She laid where we put her. Occasionally, she would get up and turn around in another position and lay down again. Sometimes she ate on her own and other times we force fed her. I believe that without the IV fluids to stabilize her, we probably would have lost her. We were able to do blood work and found that her kidney levels were very poor. She needed to be on a special prescription kidney diet but she did not care for it at all. Just after the first weekend that she was with us, she came ever so close to being euthanized again. But just before the injection, I took Bambi for a little walk. I decided to weigh her, on a whim, and found that she had gained weight! So we put the syringe aside and decided to take it day by day. When she was still sleeping at the kennel, I would see her nesting and digging in her bed on camera one night. I took that as a good sign that she was feeling better! 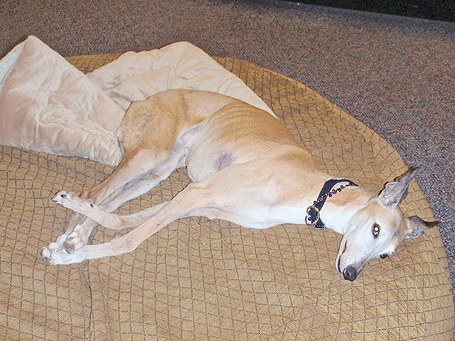 For now, Bambi spends her days visiting the various NGAP offices and is now considered part of our staff. She loves attention and affection. She moves from room to room, will stay for awhile, and then will move on to visit someone else. Pat Thomas, who now takes her home every night, tells me that she sleeps cockroach-style in her bed. Pat's husband, John, discovered that she really likes burgers from the fast food restaurant! Bambi joined us for Greyhound Sunday on November 7th and I think everyone got a chance to pet her. She has such a wonderful impact on everyone that she meets because she is such a sweet girl. 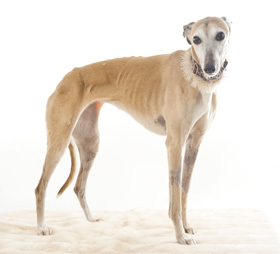 Longtime NGAP adopters Claudia and Charles Geltz, happened to see Bambi when they were bringing in their four special greyhounds in for boarding, not long after she was returned to us. Although they only had a chance to see her for a brief moment, they called while they were on vacation to see how she was doing. When they returned, they were so happy to see that she was still alive that they left us a generous check to put towards her care. We were all so very touched. Despite our efforts, we have only seen a minor improvement in Bambi's kidney levels. We're not quite sure how much longer she will have but thankfully, she will be surrounded by people who love her for her final days. We will try to make each and every one of them good. Bambi is now up to 49lbs! She still looks a bit thin, but she now has an aggressive appetite! She enjoys her days here at the office and probably loves being at Pat and John's home at night and on the weekends. We are so proud of her success story - we can only hope it continues! Bambi is up to 50lbs! She loves lounging on the big bed in the office where Iceman used to always lay and still goes home with Pat, John and Queenie every night!